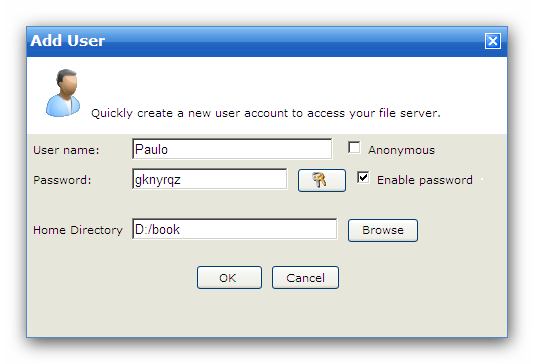 A user account is required in order to obtain access to the server. At its most basic level, a user account defines login credentials (i.e., user name and password), a home directory, and a set of Directory Access Rules that defines the areas of the system accessible to the User and the actions they can perform in those locations. Click "Quick Add" button to add a user with basic level information. If you want to add a user with detailed information, please click the "Add User" button. The user name is provided by the client as one part of authenticating the session to the server. 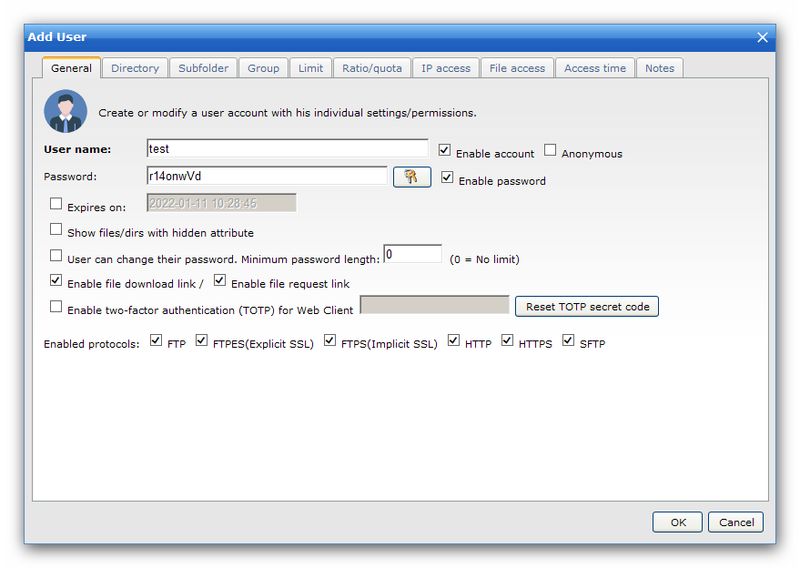 In addition to the user name, clients must provide a password to complete authentication. User name must be unique for each account specified at this domain. User name may not contain any of the following special characters: \ / < > | : ? *. NOTE: There is a special user name "Anonymous". Usually it is used by visiting guests on your server. For anonymous user, password is not required and the field should be left blank in this case. The password is the second item required for a session to be authenticated with the server. Uncheck this box to disable the current account. Disabled accounts remain on the server but cannot be used to login. To re-enable the account, check the Enable account box again. This account would be automatically disabled at the specified time. With this option, files and directories with hidden attribute will be shown in the file list. By executing FTP command "SITE MSG message", the user can send messages to server. By executing FTP command "SITE PSWD oldpass newpass", the user can change his/her password. Web Client also provides this function. Select the protocols you want to enable for this user.